BETHPAGE, N.Y., June 5, 2009 -- On the celebration of the 65th anniversary of D-Day, veterans who have been hired by Northrop Grumman Corporation (NYSE:NOC) and other Long Island companies joined Nassau County Executive Tom Suozzi to salute the success of the municipality's new Warriors to Work program and encourage more Long Island businesses to hire returning veterans. Nassau County's Warriors to Work program, announced in December 2008, is a public-private partnership aimed at providing employment opportunities for our nation's veterans. According to the Bureau of Labor Statistics, in 2008 the national unemployment rate for veterans who have served in the U.S. armed forces since September 2001 was 7.3%. The unemployment rate for non-veterans in 2008 was 5.6%. According to the U.S. Census Bureau, there are approximately 75,000 veterans living in Nassau County. 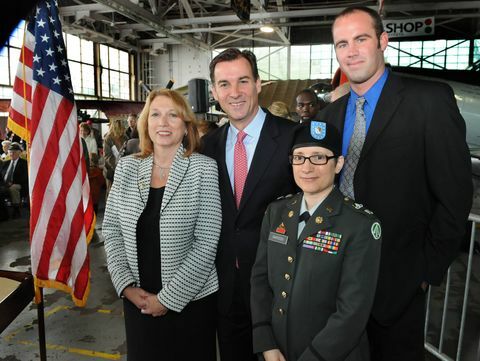 "The Warriors to Work program has placed several veterans with private employers, including Northrop Grumman, and we thank those employers for their participation, but we need the business community to do more," said Suozzi. "On this 65th anniversary of D-Day as we remember those soldiers who gave their lives for our freedom, we must never forget their commitment and the commitment of those heroes who return home." "Northrop Grumman's relationship with Nassau County and its Warriors to Work program has enabled us to recruit additional talent to our company beyond our own veterans' recruitment program, Operation Impact (which focuses on hiring disabled veterans from Iraq and Afghanistan). Since one in five of our employees are veterans, we're proud to work with County Executive Suozzi to ensure that more of our returning veterans have opportunities for employment," said Pat McMahon, vice president and deputy, Battle Management and Engagement Systems Division for Northrop Grumman's Aerospace Systems sector. Suozzi was joined by McMahon and veterans Deborah DeCicco and Joe Fleming. Fleming, a former North Carolina Army National Guardsman started at Northrop Grumman in April 2009 as a software development and integration engineer on the Broad Area Maritime Surveillance Unmanned Aircraft System (BAMS UAS) program. DeCicco starts her employment at the company on June 8 as a program manager also for BAMS. She is a retired Lt. Col. from the U.S. Army Reserve and last served as Assistant Chief of Deployment Operations. She is also a veteran of the Gulf War. "I feel great to be joining Northrop Grumman. I know I have found a new 'family,' one who I know appreciates what veterans, like me, have done for their country," DeCicco said. "It makes me feel proud that they recognize the value my experiences as a soldier supporting the global war on terrorism, and the skill set I am bringing to this new job. In the end, it is about making sure our troops have what they need to be safe and perform their mission. For me, there is no better job I could have today." Suozzi also announced the new assignment of J. Scott Castillo as program coordinator of Warriors to Work. Cpl. Castillo joined the armed forces after 9/11 and served under the U.S. Special Operation Command as a U.S. Army Airborne Ranger with the 1st battalion of the 75th Ranger Regiment and served tours of duty in Afghanistan in 2002 and Iraq in 2003. He also served with the 69th Infantry Regiment. Suozzi said veterans can call the Nassau County Veterans Service Agency's Warriors to Work hotline at (516) 572-8451 if they are seeking employment and are linked with a participating employer. The County will continue to conduct outreach to veterans in Nassau County including those veterans that are returning from war. Veterans seeking support under Northrop Grumman's Operation Impact program on Long Island should contact Ada Palatnik at (516) 575-4690 or visit the Operation Impact web site at www.northropgrumman.com/oijobs .